Most of the people only think of buying their dream home. Very few actually buy their dream home. 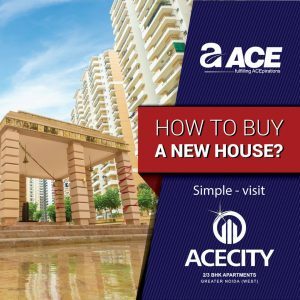 Now, the point is thinking part is gone, this is the perfect time for you to make dream home come true as Ace is building your dream homes. The most luxurious and relaxing home spaces for this generation of people who like to live freely and fully. Designed by the best architects, planners, and engineers to make your home your home sweet home. Ace City is one of the best housing projects in Noida extension. Fulfilled with all the modern facilities and amenities, this project is the new dream home for people who want to raise their living bars. The exclusive clubhouse is the main attraction of the Ace City providing all the indoor activities, games and many more. More than half the area is devoted to green spaces and many green spaces are scattered all around the project to give the essence of a natural environment. The project is offering well planned and spacious ready to move in 2 and 3 bhk apartments in Greater Noida West with large balconies. The project location is very exclusive as the project resides in greater Noida west which is the greenest and most planned sector of Noida. People who want to experience living in pollution free environment can freely come and explore the new living destinations which are created for today’s generation people. This is the place where you can freely and fully live your memories.